Today, people want walk-up-and-use solutions that are easy for staff and students to use. More and more students have access to a 1:1 device, as do staff, so it’s crucial everyone can connect and share content from their laptop or tablet, whether it is running Windows, iOS or Android. CTOUCH have made sure you can share content across all devices. They’re currently launching a ground-breaking interactive display for the corporate market. For use in meeting rooms, the interactive display works seamlessly with Skype for Business and presenting. With both education solutions from the Laser air+ and business solutions like the Leddura2meet and Leddura2share, CTOUCH can offer much more than just an interactive board. The CTOUCH Laser air+ offers your students a more exciting and engaging way to learn. By incorporating the Laser air+ into your classrooms, you’re preparing for the future. Pupils today are familiar with touch screens, iPads, smartphones and more. Gone are the days of a chalkboard in a classroom. Interactive screens have slowly been replacing chalkboards and dry wipe boards over the past few years but none are as advanced as the Laser air+. You can encourage your students to work collaboratively while presenting and developing a more successful learning environment. Students can work together to create a presentation in class, then present it together on the board. Building on the skills they’ll need for higher education and their future world of work. The built-in Wi-Fi router lets you exchange data with multiple devices at the same time, meeting requirements when it comes to BYOD and content sharing. If you have iPads or tablets in your classroom, you can mirror the screen or use sharing apps to initiate polls, quizzes, multiple choice questions and more. The CTOUCH Laser air+ comes with a freeze function, which is a necessity in a classroom environment to immediately focus the whole class. The CTOUCH Laser air+ range is perfect for classrooms; the range of sizes from 55” to 86” means you’ll find a board to fit any room. The Laser air+ has a beautiful 1080p HD display to ensure perfect clarity in everything it does, including Excel spreadsheets and PowerPoint presentations. With a built-in PC on Android 5.0 with 16MG ROM, you get access to and can work with any app anytime, with ease. CTOUCH’s own operating System (COSTM), is user-friendly and gives you a great touch experience. You have instant access to over 600,000 apps in the CTOUCH app store and you can annotate over them with the annotation app. Making presenting, annotating, taking notes and engaging your audience even simpler. You can even use the plugin PC module slot (CTOUCH Easy air) to connect and mount a standard PC to the back of the panel. The 10 points of touch come as standard and with over 125 responses per second, there is no lag at all, meaning you can keep your audience engaged and interested without waiting for a response. The Laser air+ also allows you to configure your own personal gestures like swiping to close programmes or double tapping to enlarge a window. Wherever you plan on using your interactive panel, you can be assured that the toughened, anti-glare glass will endure an energetic classroom! You can count on the CTOUCH panel to be quick, and with no driver installation required1, you won’t keep your audience waiting. This, paired with the 125 responses per second, means you’ll have a seamless viewing experience. Each Laser air+ comes with an 80 Watt JBL 2.1 sound system, featuring integrated speakers that have been designed and built by HARMAN. The clarity of the JBL audio system makes presentations more exciting. The high-quality sound creates a whole new environment and atmosphere for both business and education presentations -whilst negating the extra requirement and cost of an additional audio installation. With a typical 50,000 hour usage (around 15 years of day-to-day usage) you are getting excellent value for money. With the LED technology there is no cooling element, meaning the usual distracting noise of a fan is no more, and aside from cleaning the glass, minimal maintenance is required. Don’t forget about the ‘exclsuive to CTOUCH’ built-in Oktopus software bundle. The CTOUCH bundle comes with 2 perpetual presenter licenses, 40 student collaboration licenses for a year, over 2000 lessons, 1 presenter license, 40 student polling licenses for a year, and even a year’s worth of access to Ximbus for Google! The software also allows you to annotate over web pages and other applications, and also import and amend software files created on other interactive display brands! 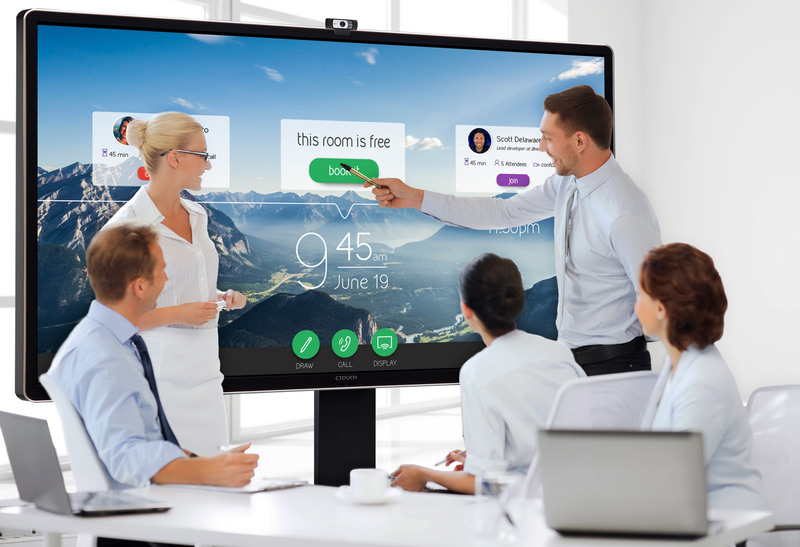 The CTOUCH Leddura2Meet and Leddura2Share enhance meeting experiences. They make Skype calls clearer, presentations more interesting and encourage workers to work collaboratively. You can annotate over sketches, excel sheets, blueprints and more, share with other devices and create meeting notes and minutes. Leddura panels start up without a delay and are a fantastic addition to every meeting room. With the Leddura 2Meet and 2Share sharing work documents, Skype calling and booking meeting rooms is easier than ever. Making meetings more productive and engaging for everyone. What does the Leddura 2Meet do? The Leddura 2Meet was built to make meeting room communications easier and simpler in one solution. By combining functionalities like annotating, video conferencing via Skype for business, wireless sharing and room-booking, the Leddura 2Meet makes booking and conducting meetings easy and efficient. What does the Leddura 2Share do? The Ledurra 2Share was designed to give you the opportunity to share digital content wirelessly and securely whilst in meetings. It also makes meetings and presentations more engaging with annotation. 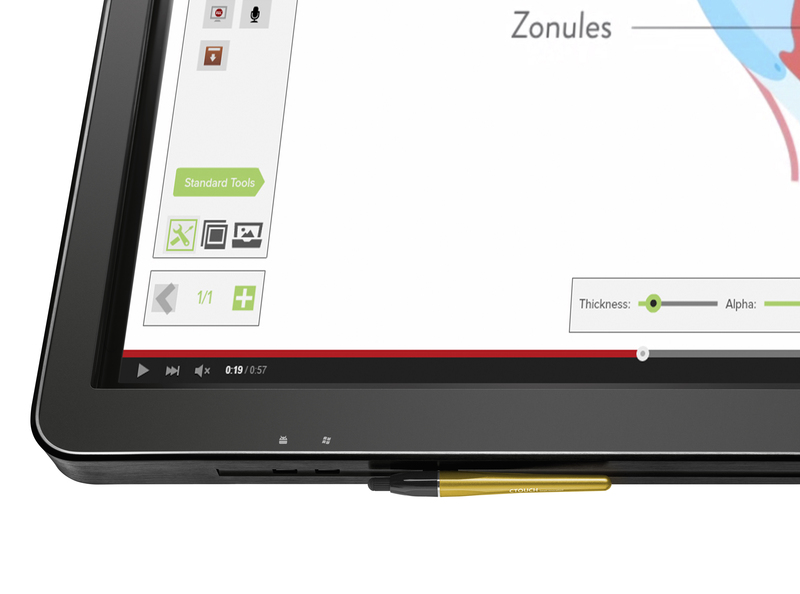 The Leddura 2Share makes working collaboratively… easy.